Book Classified Advertisements at discounted rates in Times of India Newspaper through Ads2publish.com, a leading Times of India Advertisement Agency in Chandigarh. We are Times of India Advertisement Agents helping you to book ads in Times of India Newspaper at lowest rates and best service. We have an advertisement booking centre in Chandigarh which facilitates us to book classified advertisement for Times of India. At our online booking centre we don't charge anything extra from our customers for publishing their ad in Times of India. Infact, the advertisement offers and packages for Times of India Chandigarh Newspaper have been effectively showcased so that you don't miss the opportunity to save money and get the best response from your advertisement in Times of India. 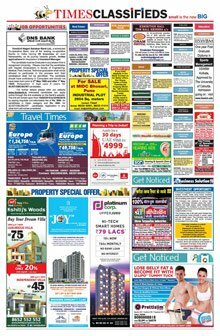 Ads2publish is a product of Bhaves Advertisers, an authorized advertising agency of Times of India serving clients to book ads for Chandigarh edition. Being a leading Ad Agency of Times of India, we publish your ad at the same cost or even lesser than the tariff rates using our online booking service. Times of India is a leading Newspaper in Chandigarh City. It has good circulation and reach as compared to other leading newspapers in Chandigarh centre. Advertising in Times of India paper gives you good response and you can reach your targeted readers effectively at low cost. People who has advertise in Times of India Chandigarh Classifieds has given Average 4.5 Star rating for the response they recieved. Select the Advertisement category from the above list to advertise in Times of India Chandigarh classifieds column. Choose from the list of Classified Ad Rates of Chandigarh centre for the category selected. Compose your ad taking help of Times of India Classified Sample Ads so that you can convey advertisement effectively to your targeted audience in Chandigarh. How are price charged for advertising in Chandigarh Edition of Times of India? Classified Advertisements in Times of India are accepted in two formats. One is Classified Text Ad and the other one is Classified Display Ad. Both are charged differently because of the difference in their format and placement in Chandigarh Newspaper. If you are not looking for Chandigarh Edition of Times of India Newspaper then choose from the following categories to shift to other city: Matrimonial, Recruitments, Property For Sale, Property To Rent, Name Change, Lost Found, Vehicles, Astrology, Business, Computers, Classified Remembrance, Education, Obituary, Personal Announcement, Personal Messages, Retail, Services, Travel, to book your classified ad.